Creative strategies to literally live in your Jeep JK, drive (and survive) endlessly and even earn money in the wilderness. Lone Jeeper vs. Weekend Wheeler : 2 different species with different needs. Make the right choice for your Wrangler expedition vehicle. 4x4 club members are fond of stubby bumpers for four legitimate reasons: Stubbies are light, deliver incredible approach angles, ford a stream with less resistance, and look awesomely cool. However, they are quite the wrong fit for a solo Jeeper scouting the remote wilderness. 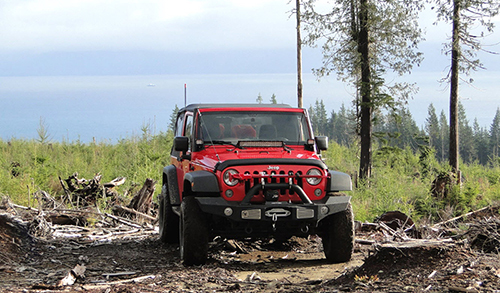 Prepare your first expedition with your Jeep in the extreme remote wilderness. Exposing vital parts is clearly not increasing your chances to reach your destination... or to ever come back. 1. To deflect hits and protect tires/suspension/brakes: A solo Jeeper traveling long distances in the remote wilderness exposes his Wrangler to severe hits. Running headlong (all day long) into wildlife (a deer is 400 lbs), stray branches, or young growing trees on abandoned trails puts vital parts at risk (shock absorbers, sway bar links, tie rod ends, break lines, brackets, etc.). 2. 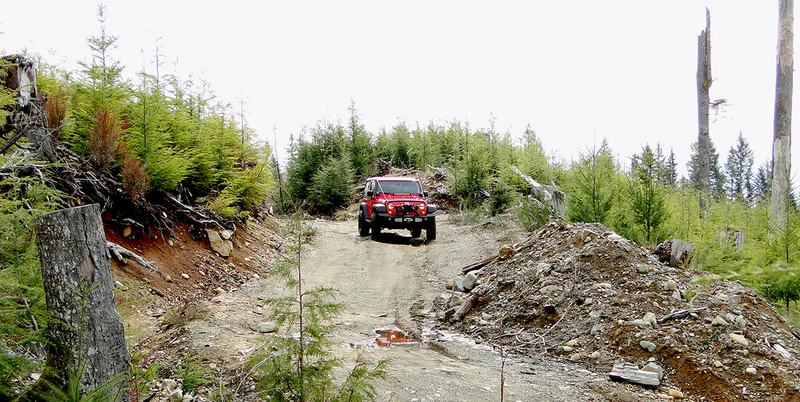 To survive a head-on collision: Driving often on one-lane backcountry, mining, or logging roads increases the risk of an off-set head-on collision with a heavy truck or with another 4x4 vehicle wandering in the area at the same time. A full-width bumper could divert a powerful hit and save your life or prevent you from being seriously injured. 3. To bash against obstacles (on purpose): Sometimes, you need to get a huge tree trunk or a boulder out of the way. 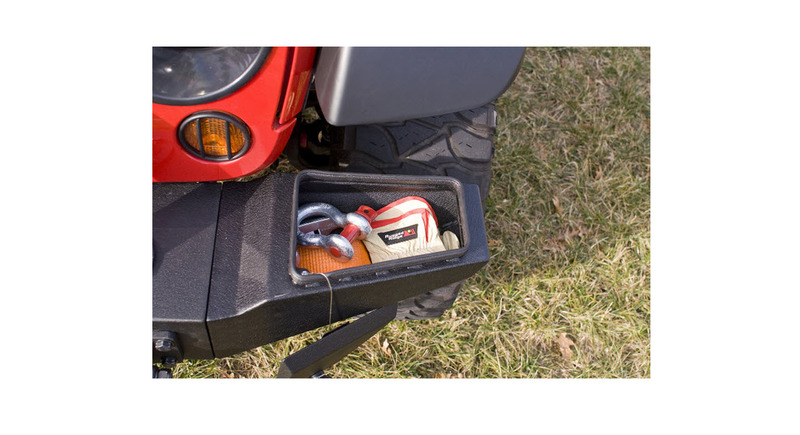 You might also have to use your Jeep as a battering ram to batter down fences or gates. 4. To hide (and protect) the winch: A sunken winch mount is the best way to protect your best friend on the trail. 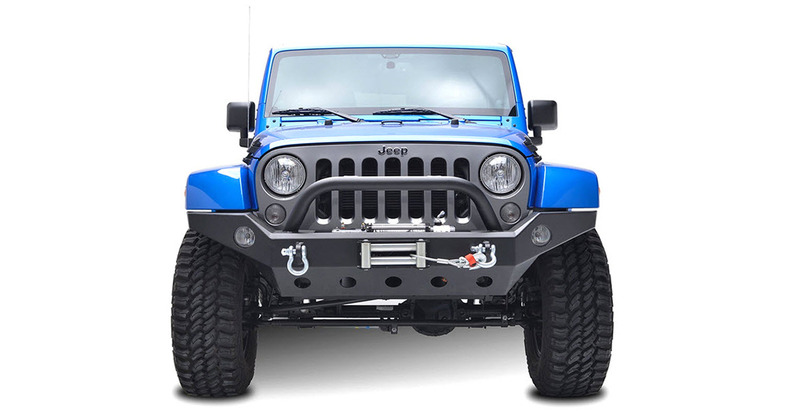 Most stubby bumpers don’t have a deep sunken winch mount housing because the manufacturers’ goal is to increase the ground clearance by keeping a high profile. 5. To use fog lights efficiently: Fog lights must be aimed correctly to work. If they are centered (like on a stubby), they become quite “decorative” and even dangerous because they might light up the fog and blind the Jeeper himself. Fog lights have to be wide-mounted and low-mounted in order to illuminate the trail at a wider angle and greater distance. And that’s why a full-width front bumper is a better fit. Fog patches are common at altitudes or in dense forests (where the moisture level is high). Fog lights could also be somewhat helpful in the case of a forest fire. 6. To avoid problems with the police: In many states and provinces, stubbies are illegal but tolerated. Or not. You don’t want to get into that kind of trouble while traveling far from home (or being a vagabond). 7. To look serious: In my humble opinion and based on my personal experience, guys with stubbies look a bit goofy in the remote wilderness. For example, one-ton pickups and Class 8 trucks rule the world in the remote areas of Alaska, Yukon, the Northwest Territories, BC, and Alberta. It’s not really the place for hobbyists. Whether you are looking for a job or just traveling for fun, I’m afraid that showing up with a Jeep that looks like a teenager’s toy won’t make you look any good. Stubbies are no match when it comes to weight, approach angles, ground clearance, tire clearance, turning radius, and river crossing. We all got it. 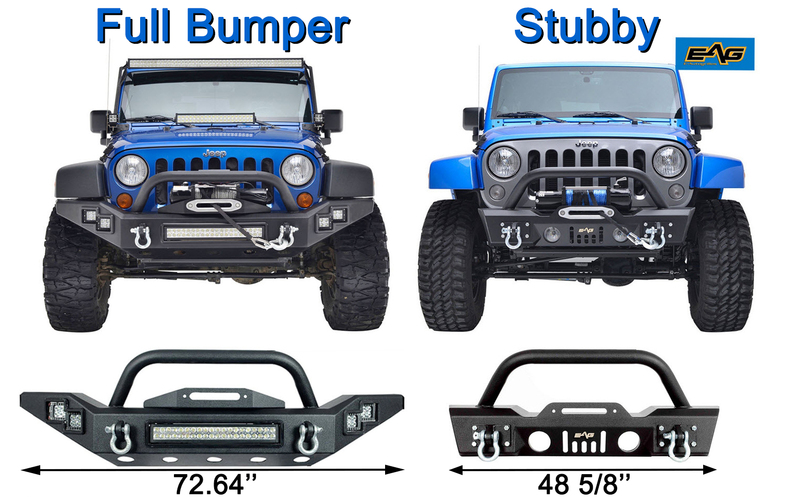 But you can still find plenty of full-width aftermarket bumpers that achieve good results for prices ranging from $400 to $800. Want an example? 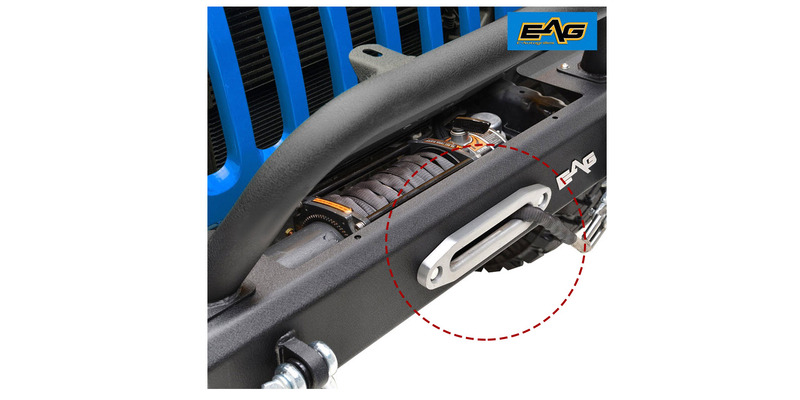 This EAG #51-0360 (from E-Autogrilles) is an entry level bumper sold for less than $500 and weighs only 88 lbs. If you don’t like the hawse, it’s easy to replace it. There are many options. - Weighs less than 100 lbs. This is the XHD Modular Bumper 11540.10 from Rugged Ridge. You can customize it in hundreds of different ways. Just follow your needs and imagination. It’s compatible with most winches, stingers, hoop overriders, and so on. And there are cool products like storage ends. 1. Too expensive: It’s a good quality, but I’m not ready to spend up to $2,000 to get a lot of components. 2. Not as strong as a one-piece fully welded bumper. 3. Requires storage: If you want to constantly switch from full width to stubby, where will you store the unused components? Not practical if you are a Jeep dweller and/or constantly on the go. Note: I didn’t mention “mid-width bumpers” because those keep 50% of your tires exposed, and tires are not bumpers. A severe hit against a tree trunk will probably end your journey.